You'll find yourself reaching for this versatile duffel style gym bag so many times that you may want to mass produce them! We used to go camping a LOT... as in every weekend and vacation. It never seemed like I had enough bags to keep things organized. That dilemma seems to have rubbed off on my daughter... she wants a bag for everything to keep things organized and at hand. This duffel bag is great as a tool bag in the car and the perfect size for small children to pack and carry as an over night bag to Grandmas house. The bag will finished bag is thirteen inches wide, five inches deep and seven inches tall. This bag is not lined which makes it a relatively easy sewing project. Cutting Note - Rotary Cutting Tools are best to assure that you are cutting truly square pieces. Using the fabric to make your handles, as described in this step, will create a strong, sturdy handle that can carry a heavy load. Although you could use webbing, the self fabric handles are less apt to fray over time. Fold the raw edges in to the fold line and press well. With the folds in place, sew close to the folded edges that are separate to sew them in place. 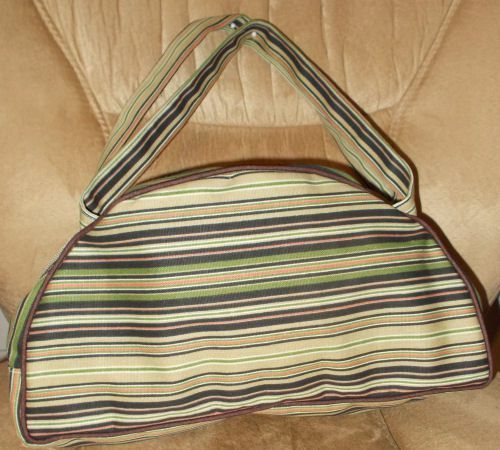 Although the addition of piping to the seams is not necessary, it does assist the bag in holding it's shape. Sew piping to the side sections starting at the center of the flat bottom. Mark the top center of the side pieces with the piping attached. Measure over 5" on both sides from the center marking. Pin the handles in place so that the edge of the side so the outside edge of the handles are at the 5" marks. Sew the handles in place on the piping sewing lines, sewing multiple times for the handles to be securely held in place even if the bag is loaded with heavy tools. This zipper is sewn in so that it is exposed and the seam allowances are top stitched so they will not get caught in the zipper. Place the zipper right side down on the right side of the fabric aligning the long edges. Sew the zipper to the fabric using a 3/8" seam allowance (following a guide on the zipper tape). Apply a seam finish to the raw edges, securing the zipper tape to the fabric at the same time. Press the fabric back from the zipper teeth. Top stitch the seam allowance to the fabric so it will not get caught in the zipper. With the right sides together, align the ends of the zipper with the 5 1/2" ends of the bottom and bottom side sections to form a continuous loop. Sew the sections together using a 1/2" seam allowance. Press the seam allowances downward toward the bottom section (away from the zipper section). Top stitch the seams in place sewing close to the seam on the bottom section. Mark the center of the zipper on both edges. Open the zipper enough that you will be able to turn the bag right side out after you have sewn the seams. Starting at the center top of the sides of the bag, match fabric at the edge of the center of the zipper. Pin the entire edge on both sides. Sew the bottom/zipper section to the sides of the bag using the piping as a seam allowance guide. Using any of the suggested materials or something similar, cut the bottom reinforcement to 12 1/2" by 4 1/2"
Cover with fabric if desired.